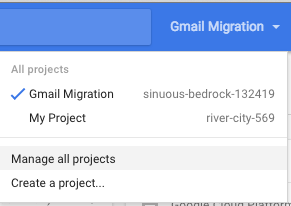 UPDATE: The imapsync project accepted a pull request I made to support Google’s .json files. This will make things a little bit simpler. The next release isn’t in the public git repo yet, but you can test it via the repo I used to make the pull request from. I will update this tutorial using the .json files once it’s in the public repo. 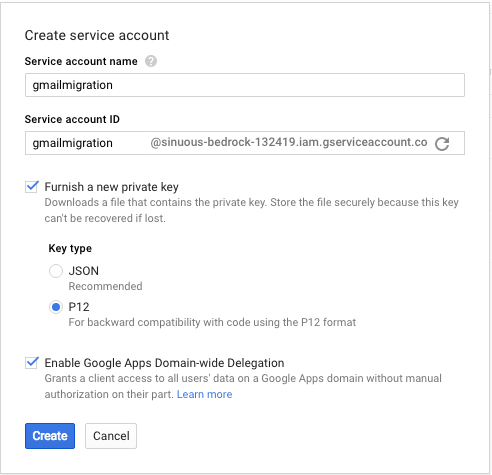 To use imapsync to migrate a Google Apps domain (without requiring passwords for every account), you’ll need to setup OAUTH2 access. And once those steps are completed, you just need the service account name and key to access any account on your domain via imapsync. 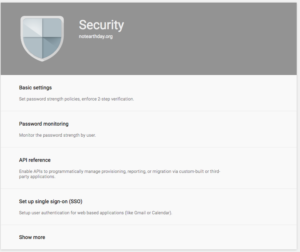 Go to https://console.cloud.google.com and login. We’ve created our service account, “gmailmigration@sinuous-bedrock-132419.iam.gserviceaccount.com”, as well as created our service account key. 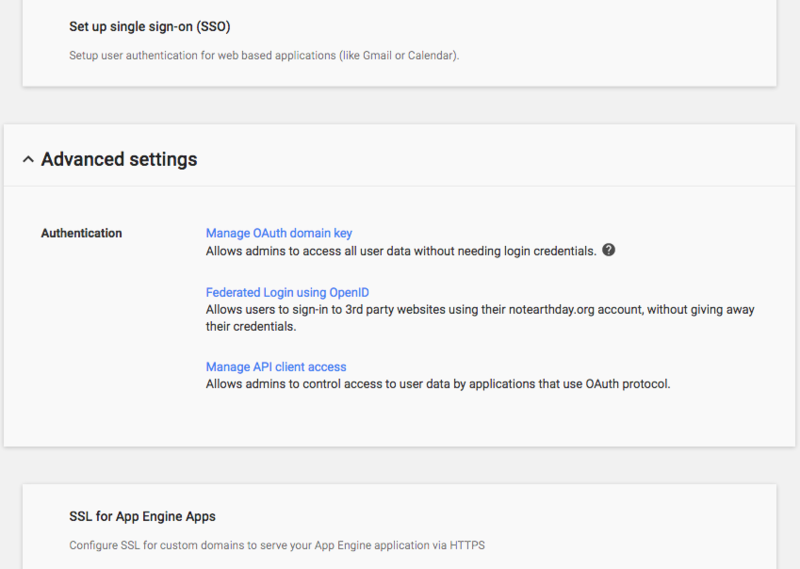 We need one last piece of information, and that is the oauth client id for the service account. 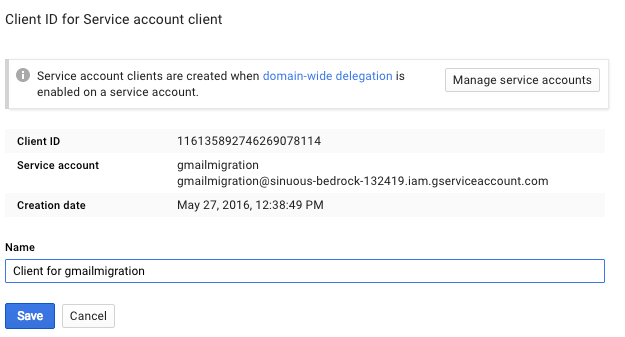 Now, we need to give this service account access to your Google Apps Gmail domain. 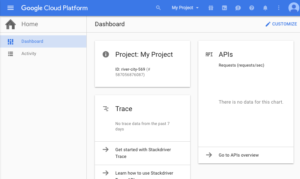 Open up the “Advanced” section, and choose “Manage API Client Access”. 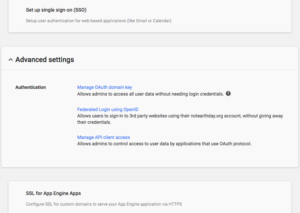 Special note: If you have a “Manage OAuth domain key” as in my screenshot, ignore it. It’s not relevant to this tutorial. 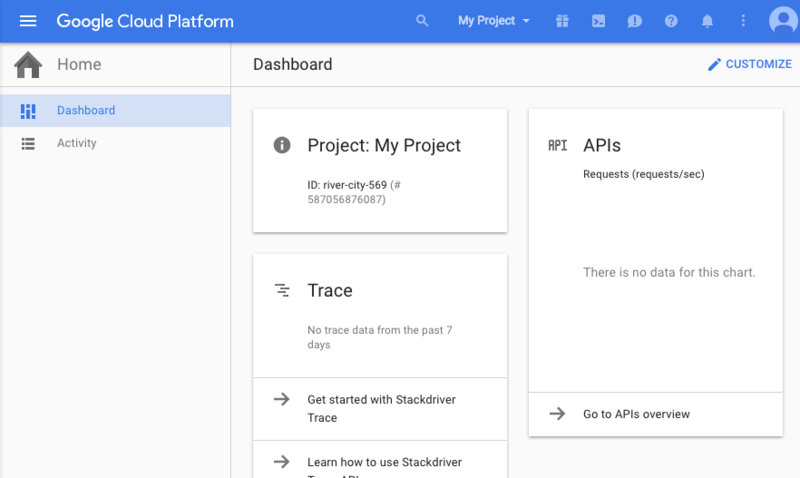 It’s an old OAuth method that is no longer supported by Google. Finally, we’re where the magic happens. 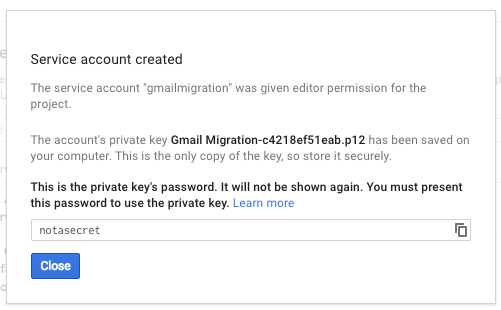 This is where we can give our service account access to our gmail domain. 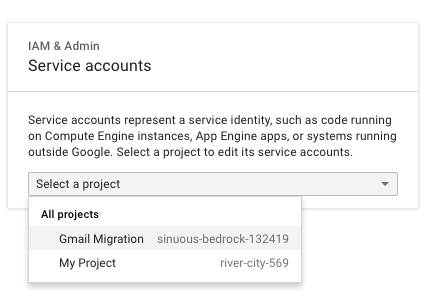 Enter the Service Account Client ID in the “Client Name” field (“116135892746269078114” in this example). 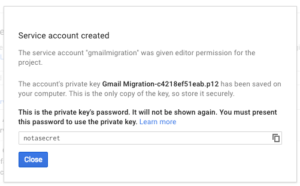 Enter “https://mail.google.com/” in the “One or More API Scopes” field. 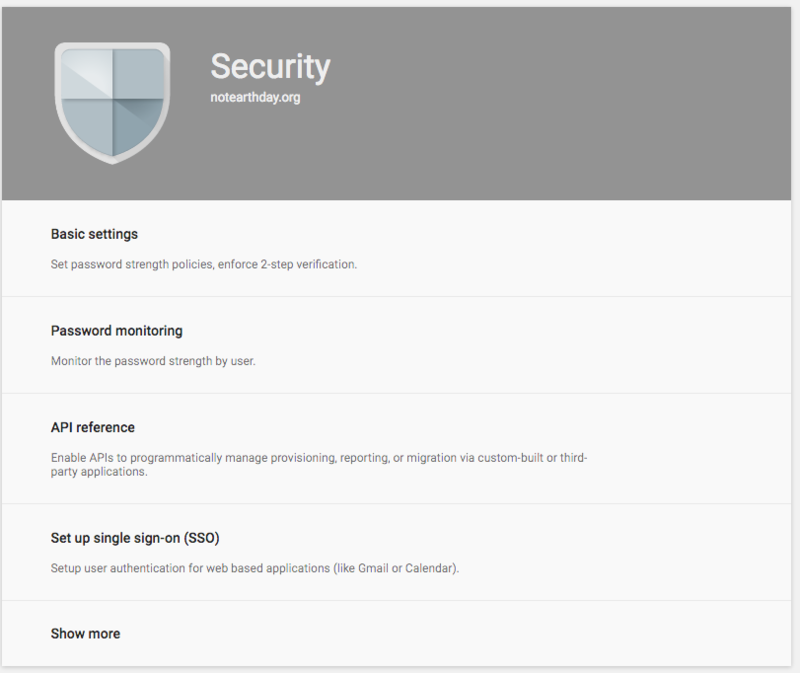 We’re now ready to use our XOAUTH2 service account with imapsync! 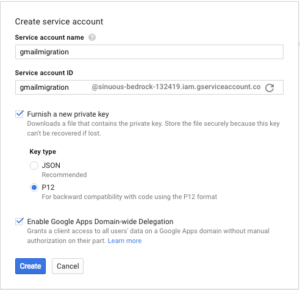 Here is how you use your XOAUTH2 service account with imapsync. I’m operating under the assumption that you already know or can figure out how to use imapsync on your own. This is not a tutorial for imapsync. 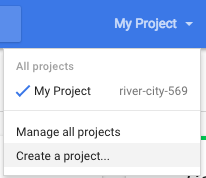 Rename the file so there are no spaces. 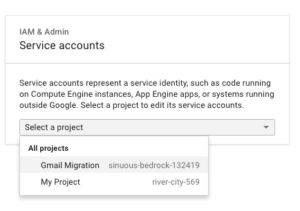 Google has using spaces by default in the .p12 files, so you almost definitely will need to do this, as imapsync’s XOAUTH2 support doesn’t parse filenames with spaces correctly. I’m the jerk that wrote the XOAUTH2 code, so I apologize profusely. drwxr-xr-x  3 mrgus mrgus 4.0K May 27 14:03 .
drwxrwxrwt 16 root  root  4.0K May 27 14:13 ..
Use of uninitialized value $sockargs in join or string at /usr/share/perl5/Mail/IMAPClient.pm line 360. Read: 	* QUOTAROOT "INBOX" ""